Now, I'm no big city lawyer. "...these procedings have been a travesty of unjustice...ness..."
I didn't go to no Ivy League college. I wasn't born with a silver spoon in my mouth. I ain't not know nothing about no double, triple, or even quad...ible negatives. I don't use fancy words, nor do I wear a fancy suit or eat fancy food. I don't drive one of them classy cars from Germany or Korea. I can barely read, and manage only to do that poorly...but if there is one thing that I've learned, it's that my client is innocent. Your honor, the jury, witnesses, Mom (hi Mom! 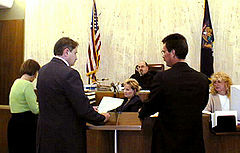 ), I feel that we the defense team and I the lead defending lawyer-guy have exceeded the standard in proving reasonable doubt that our client, Mr. Thomas Crupville, a pillar of the community, petter of cats, feeder of birds, and falsely accused murderer, did not, would not and, indeed, could not, do the things that he stands accused (as he sits in this very courtroom!) of doing. This heinous crime, of which my client is both not guilty as well as innocent of, is horrifying to you, me, them, and my pie-baking, frail, and elderly mother, Mrs. Defenselawyerguy (hi Mom! ), but we have to look past the crime itself and look at the criminal, or possibly criminals, responsible for this reprehensible (as well as illegal!) act, rather than continue this...this...this witch hunt against my client. "But where do we look?" you, the jury's, wide-open and thoughtful eyes say to me. "Why, look at yourselves!" my honest, hard-working eyes reply, "For within each of us is a monster. Truly, a monster of monstrous proportions". "This is a trial, not a media circus. Be sure to get my right side. That's my good side. Look within yourselves. You know that I speak the whole truth, nothing but the truth, as well as other things with which the truth is tangentally connected, although at this date and time not in that particular order. You, jury person right there, left no tip for the grease-stained, elbow grease rubbing, greasy waitress down at the Greasy Spoon on the corner (Monster!). You, jury...ist number seven, stole your neighbor's newspaper (Monster!). You denied his children the morning funnies (Monster!). You denied his wife's right to the 'Home' section (Monster!). Worse of all, you denied him the right to do that most American of tasks; reading the paper in the bathroom while pinching one off (Monster!). You make me sick. Sick to my stomach, in fact. Not ten feet away from you, even Mister Prosecutor has turned green with the nausea that comes from being within sight of you. When Mister Prosecutor goes home tonight and his wife, Mrs Prosecutor, asks him how his day went, do you think he will tell her about what he learned about juryguy number seven? I pray to the heavens above that he doesn't, and if you have a decent bone left in that disgusting, criminal body of yours, Mister Juryguy, you'll do the same tonight and every night before you go to bed until the day you die (Monster!). Look now at the prosecuting attorney. 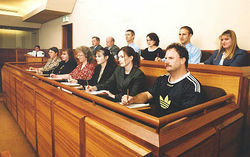 "Jury...ist number five, are you single? Oh. Do you have a sister?" He sits there with his "evidence" and "witnesses", and thinks that he's "proven" that my client did the "crime" of which he has been so unjustly accused. Over the past nine days Mr. 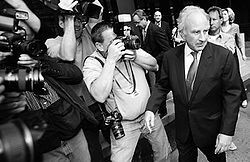 Prosecutor has tried, and failed, to make his case. He says that multiple "witnesses" saw the victim talking with my client on the night she was murdered. He says that the "evidence" shows that the victim was beheaded by my client. But, I ask you, how could she talk with my client if she had no head? Why, I repeat, why did none of the "witnesses" mention the fact that she had no head? You'd think that a detail like that would've stuck in their minds, y'know? Which is it, Mr. Prosecutor? Which. Is. It? The prosecution says that the victim's head was found in my client's freezer. First, they say that she was headless. Next, they say that she was only a head. Will they ever get their story straight? And where's her testimony? I've looked at the court transcripts. I've seen the affidavits from the prosecution's "witnesses". Do you know what I didn't see? That's right, I didn't see a single statement from the victim saying that she was murdered by my client. "Why is that? ", I ask you. Why. Is. That? Mrs. Jury person number four, do you like flowers? You do? Do you see what happened there? She told me. But what did the victim tell us? Nothing! Common sense shows that it's because she was not murdered by my client! I look around this courtroom that we are in here, today, and I only see one victim. My client. Railroaded by the State, pilloried in the press, looked down on by even the lowest dregs of society. "We must remain focussed on justice, your honorness. The persecuting lawyer-guy has, over the course of the past two weeks, constantly tried to derail this trial with distractions that distract from the, um, what's that flag on the right? Were you a Cub Scout or something?" My client is the real victim here. Simply put, he could not have committed the murder, as he was asleep at home at the time. At home. Asleep. I've heard of people snoring in their sleep. I've heard of people walking in their sleep. Heck, I once made a sandwich in my sleep, but I have yet to murder in my sleep! P'shaw! Mister jur...ist number two, have you ever murdered in your sleep? No? You're innocent, you say? Let me warn you, if you convict my client here today, tomorrow you will be the defendant! These preposterous allegations cannot stand against the weight of my client's innocence! As defense exhibit A, a copy of the film Twelve Angry Men shows, the prosecution is trying to sway you, bias you, taint you with their "evidence". In addition, the prosecution says that the police found in my client's basement a "grave". Well, let me tell you, I like digging in my basement as much as the next man. I've dug many a mighty fine digs in my time. The police say that the picture of the "crime scene" shows a "grave". Now I don't have the best vision in the world, but all I see is a hole. Graves are in graveyards. Holes are in basements. Is Mr Crupville's basement a basement or is it a graveyard? Just going by the name alone it is, nay must, be a basement. Therefore, it can't be a graveyard. The prosecution would have you believe that a basement is really a graveyard. Do police places not have dictionaries? Did the expensive, elitist, lawyer school place that Mister Prosecutor attended not have one, as well? Clearly, they are wrong. "Wrong", I say! You really don't need to keep banging that hammer on your desk, Mister Judge. I'm almost finished. Lastly, as twelve complementary tickets to see Trooper tonight at the Cappa, which I present to the jury as defense exhibit B, clearly clear my client's muddied reputation beyond repute! My client is innocent of all and any criminal activity, especially the "murder" of someone who couldn't even be bothered to testify! In summary, people of the court, jury, judge, Mom (hi Mom!) I rest my case.